Tony has been working with bonsai since 1983, he specialises in native European trees, in particular; Hawthorn, Yew and Pine. Tony trained under the stewardship of Takeo Kawabe and worked with many of Europes leading artists. 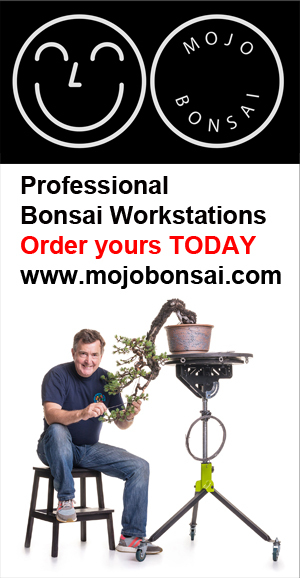 Board of Director for Bonsai Clubs International 2003-2005 and Member of Association of British Bonsai Artists, Tony is a founding member of ‘Black Scissors’ the global creative brotherhood of bonsai artists. A Royal Horticultural Society Judge Tony has overseen the judging of competitions in the UK and as far afield as China and Australia. An event planner, in 2015 and again in 2017 Tony organised Bonsai Europa the BIGGEST bonsai event to take place in the UK since 1991. In September 2019 Tony is organising the UK National Bonsai show. He has a regular column in the widest circulation Bonsai Magazine ‘Bonsai Focus’ and writes for specialist publications worldwide. Tony demonstrates at major conferences throughout the UK and Europe and across the world, including Australia, South Africa, China, Brazil, India and the USA. Nominated for a Noelanders award in 2009, World Conferences and many European events, He won his first Ginkgo award in 1997, UK winner and runner-up in the European New Talent Competition in 1995. In 2017 Tony won“Best Deciduous Bonsai” at the prestigious Noelanders Trophy in Belgium. In October 2018 Tony won a Bonsai Clubs International excellence award, only one of three presented that year, for his cascade Mugo Pine on a rock. Tony seeks to promoted Bonsai as an art form in its own right, hosting exhibitions in Museums and Art Galleries along with unusual locations that capture the public imagination. He has presented bonsai in a creative and dynamic way courting controversy and praise in equal measure. Tony has championed the introduction of a fair and transparent judging system that is now widely used across the global bonsai scene. If you would like Tony to demonstrate at your next event, provide a workshop or lecture. Or if you want to have a one 2 one workshop he can be contacted. HERE. Over the years Tony has created hundreds of bonsai for himself, clients and students: below is a small selection of some of his favourites.